Photo by Silvia April 2010. Ranunculus Ficaria (Fig Buttercup) aka Lesser Celandine. Invasive weed-like groundcover with lovely yellow blooms in the spring. It is lovely and cheerful in the early spring, but really wants to take over the garden. Lesser Celandine is a perennial herbaceous flowering plant that completes its life cycle during the winter and spring. The name is derived from Ficaria (Latin for fig) and verna (spring). Plants consist of a basal rosette of tender, succulent, dark green, shiny, stalked kidney- to heart-shaped leaves. Flowers are symmetrical, bright buttery yellow with a slightly darker center, have 8 (typical) to 12 petals, and are borne singly on delicate stalks that rise above the leaves. Tiny cream colored bulblets are produced in stem axils and become apparent later in the flowering period. Abundant fingerlike tubers are produced by the roots and are easily visible when plants are pulled up. Fruiting heads are globose composed of many achenes that are pubescent and usually abortive. 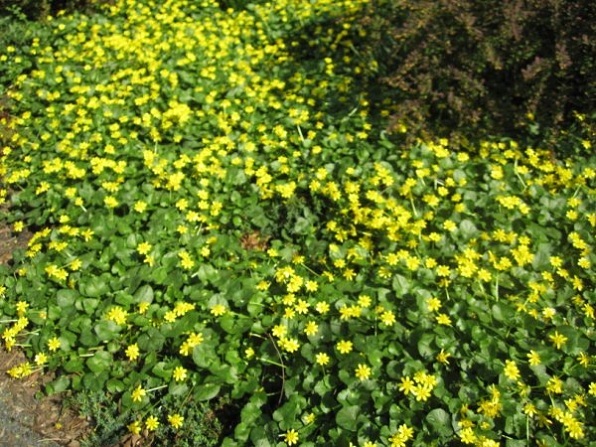 When in bloom, large infestations of lesser celandine appear as a green carpet with yellow dots, spread across the forest floor. There are many varieties of lesser celandine including a double-flowered form with many petals and dark green leaves mottled with silvery markings. Because fig buttercup emerges well in advance of the native species, it has a developmental advantage which allows it to establish and overtake areas rapidly. It was introduced to the United States as an ornamental plant. It is still available commercially in the U.S. along with many colorful varieties. All varieties should be assumed to be potentially invasive and should not be allowed to escape from plantings.